I first shared this recipe on Recipe Girl where I am a contributor. 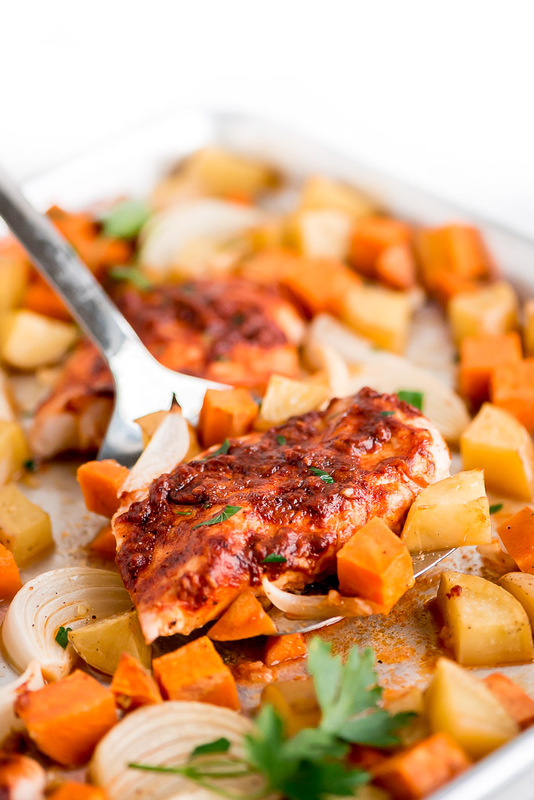 For an easy and lean meal, make this flavorful Sheet Pan Paprika Chicken all made on one pan and ready in just 40 minutes. 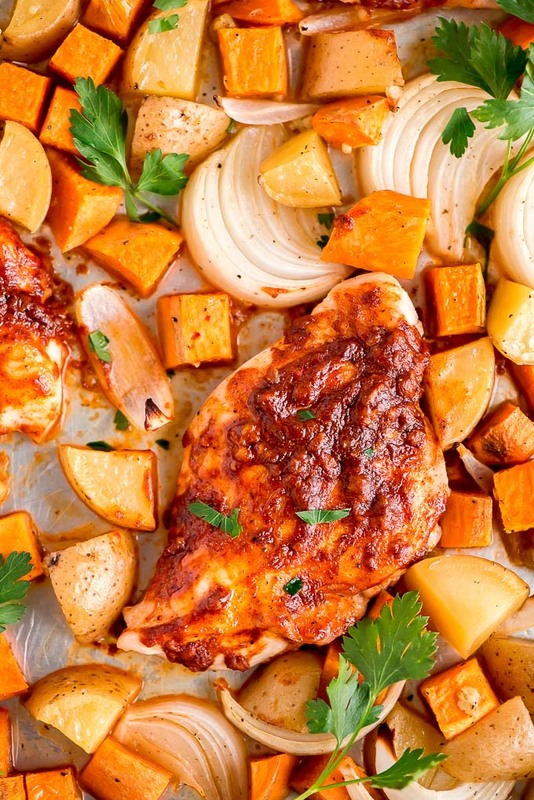 Fall is finally in full swing and this Sheet Pan Paprika Chicken is the perfect meal for the family. I love sheet pan meals because it means I don’t have to baby sit the food while it cooks, I only have to clean one pan, and it’s going to be delicious! Now that it’s finally getting cooler out you can turn on your oven to bake and roast to your heart’s content. After turning the oven off I even leave the door open to help warm the house. Anyone else do that? First, chop up the veggies. 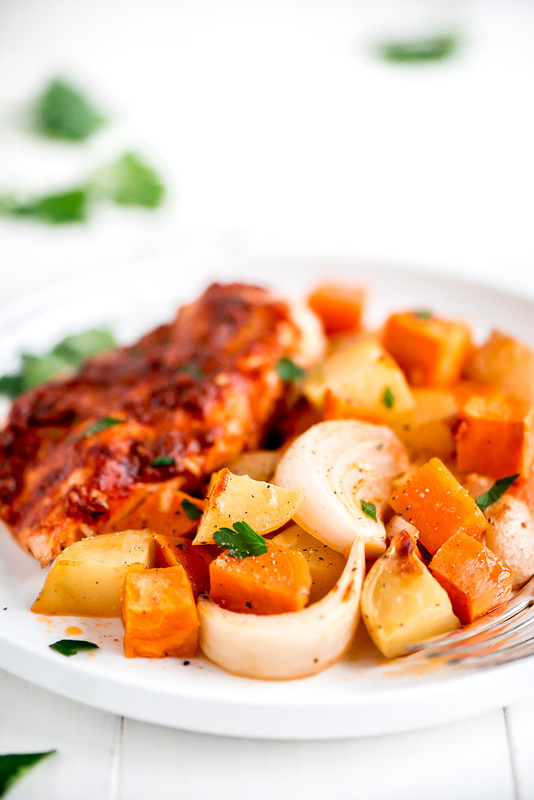 For this recipe you’ll be using Yukon gold potatoes, sweet potatoes, and sweet onions. This combination is amazing! But really, how can you go wrong with sweet potatoes. It adds the perfect sweetness to this smoky paprika meal. Once your veggies are cut, throw them on the pan and drizzle them with oil and season with garlic, salt, and pepper. Toss it with your hands and get everything nice and coated and then spread it out leaving 4 spaces for your chicken. Make sure your vegetables are no bigger than about 3/4 inch pieces or else they won’t be done when your chicken is. To prep your chicken you’ll first want to pound each breast to about 3/4 inch thickness. Then make the sauce by combining oil, smoked paprika (though sweet or regular works too), garlic, Dijon mustard, lemon juice, salt, and pepper. Rub this delicious goodness on both sides of the chicken and then place on the baking sheet. Bake in the oven for 30 minutes and enjoy it with your family. 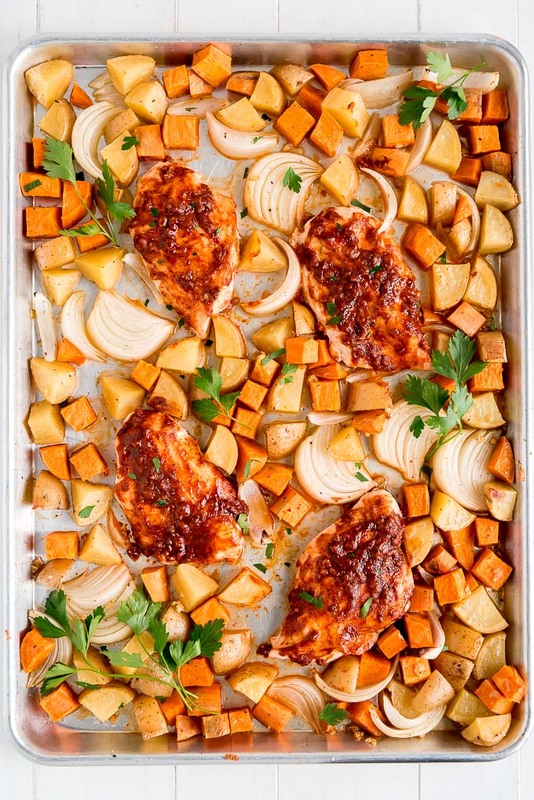 This Sheet Pan Paprika Chicken is perfect for meal prepping! When I meal prep this for my husband to take to work for lunches I like to chop up the chicken into bite size pieces after it cooks so that it’s easier for him to eat. If you want to feed you family and have leftovers for meal prep, feel free to make a second pan of it at the same time. Knife Set– I got this when I got married almost 9 years ago. I use them multiple times a day and they’re still going strong! 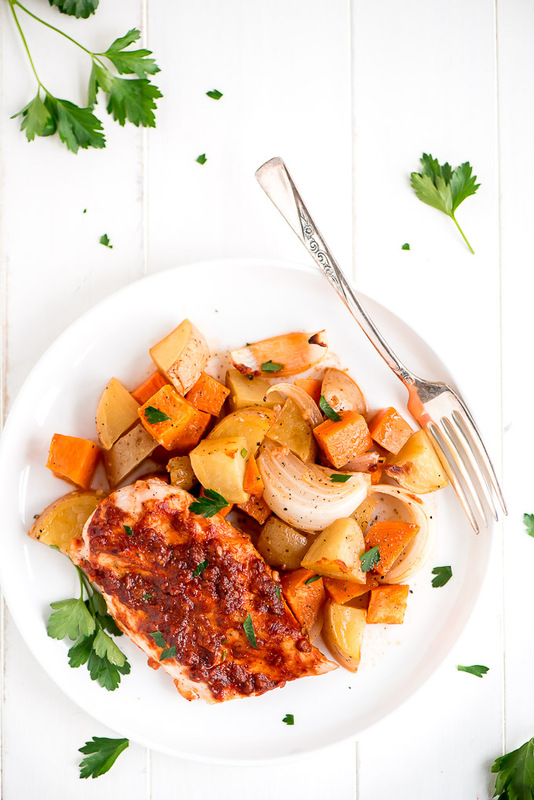 For an easy and lean meal, make this flavorful Sheet Pan Paprika Chicken all made on one pan and ready in just 40 minutes. Preheat oven to 425 degrees F. Place vegetables on a large sheet pan. Drizzle with 2 tablespoons olive oil, sprinkle with 1 teaspoon garlic salt and fresh cracked black pepper. Toss until everything is coated. In a small dish, mix together 2 tablespoons olive oil, paprika, 2 cloves garlic, mustard, lemon juice, 1 teaspoon salt, and black pepper. Spread over both sides of chicken breasts and then make space for them on the pan of vegetables. Bake for 30 minutes or until chicken is done. Sprinkle with parsley and serve. Perfect week dinner ! Thank you !